The Chinook Series is designed for all-purpose recreational use and exceptional value for the adventure seeker in you. A stable, efficient hull form, the Chinook Series offers plenty of cockpit space and our proprietary XP floor™ Technology for outstanding value and excellent paddling performance. 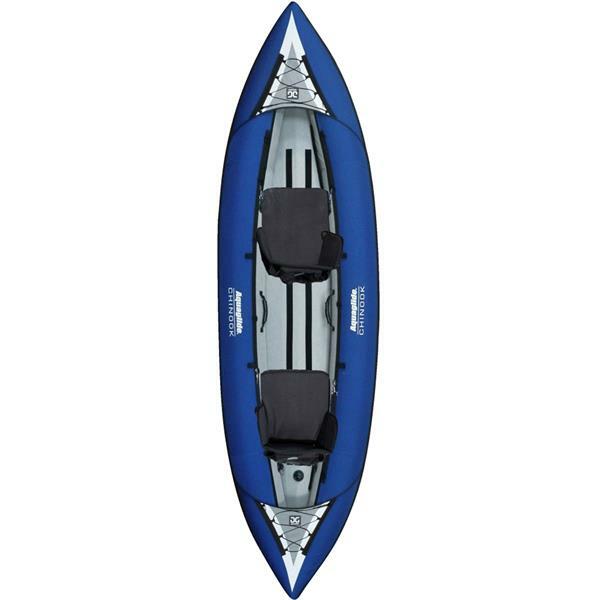 Eminently versatile by design and loaded with convenient features, this kayak series is an especially popular choice for recreational paddlers like you looking to enjoy great time on the water on all of their awesome adventures. The Chinook’s XP floor construction uses an inflatable chamber with Aquaglide proprietary X-beam Technology to produce a stiff, durable PVC beam floor while the Duratex™ hull material is blended with rugged 600d polyester for long-life and UV protection. The multiple accessory straps let you haul all the gear you want for easy stowage while sturdy molded handles around the entire kayak let you board comfortably and easily so you can get on your way quickly. The finishing touch includes our Comfortable Core™ seats that include a high backrest, mesh storage pocket, integrated fishing-rod holders, forward-only seat straps and an infinite adjustment system for convenience. The fin system includes stiff, durable, foiled fin with unique quick-release for easy setup and the convenient storage bag lets you pack out with ease so you can head on home after having the most epic day. Pump sold separately.